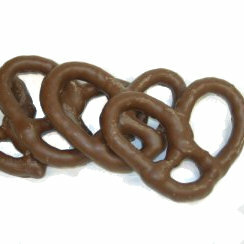 Satisfy your sweet and salty cravings with milk chocolate pretzels! We are all aware of the five tastes: sweet, sour, salty, savory, and bitter. All of us can point to some of our favorite foods that belong in these categories. What you may not know, however, is why foods that combine sweet and salty flavors are so delicious. These flavors are seemingly opposites, so why do they taste so good together? We used to believe that all the tastes had their respective zones on your tongue. Supposedly, people were not able to taste any other flavors outside of their zones. This theory isn’t true, and as we now know, all parts of your tongue can detect the various tastes. As a result, a combination of the tastes enhances enjoyment. Sweet and salty foods, like our toffee cashews, provide a good mixture of flavor that meets our desire for variety. Our bodies naturally crave salt and sugar. This is for a good reason too, as the sodium and carbohydrates that come from salty foods and sweet treats respectively are necessary for your body. Sodium is good because it helps send nerve impulses through our bodies and carbs are your body’s primary source of energy. When you’re eating any food, you’ll want a combination of tastes to provide a balanced flavor. The tastes themselves are usually not what people find unpleasant, but the overuse of any one of them. Think about a time when you’ve eaten something that was too salty. You probably felt like your taste buds were overwhelmed, and maybe you even ate something sweet afterward to balance it out. Salty and sweet foods provide a little of both tastes so you can enjoy them without getting overwhelmed. Here at Wockenfuss Candies, we offer a wide variety of delicious sweet and salty treats. Whether you are craving some of our mouthwatering chocolate-covered pretzels or want to try our tasty peanut butter cups, we’ve got all your sweet and salty needs covered. PICK YOUR SWEET AND SALTY TREATS FROM A WIDE MENU AT WOCKENFUSS CANDIES! This entry was posted on Friday, December 7th, 2018 at 11:59 am. You can skip to the end and leave a response. Pinging is currently not allowed.